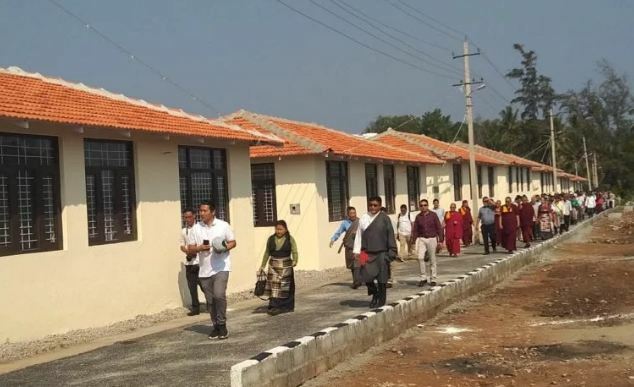 (TibetanReview.net, Apr12’19) – A new village of 80 houses for accommodating relatively newly arrived refugees from Tibet was inaugurated on Apr 10 at the Bylakuppe Tibetan settlement in Karnataka state, India. The inauguration was made by Home Secretary Mr Wangdu Tsering Pesur of the Central Tibetan Administration (CTA). Five senior Geshes and monks from the local Tashi Lhunpo Monastery performed the rituals and carried out ceremonies, said the CTA on its Tibet.net website Apr 11. The report said that of the 80 houses, 43 were funded by an aid group called PRM, with Les Amis du Tibet Luxembourg sponsoring 12 houses, Casa Del Tibet in Barcelona, Spain, sponsoring 15, and the remaining 10 being budgeted by the CTA. Earlier, on May 17, 2016, Sikyong Lobsang Sangay of the CTA inaugurated ‘Lily Village’, a new settlement with 74 houses for relatively newly arrived Tibetans from eastern Tibet at Bir, located about two hours’ drive from Dharamshala in Himachal Pradesh. This settlement was funded largely by E. C. H. Eversdijk Smulders Stichting, with Dolma Foundation contributing additional fund for the project, according to a Tibet.net report May 18, 2016. There have been very little new arrivals from Tibet in recent years, especially after 2008, due to joint strengthening of border control by Nepal and Chinese authorities in Tibet.